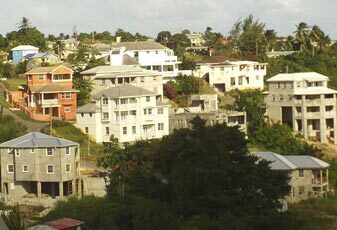 Barbados is a bellwether for the English-speaking Caribbean and things don’t look good for the region now. No; Barbados has not crashed. It remains the territory with functioning social services and the best telecommunications and public transportation systems. But you can see the signs of difficulties for the majority of the local population. “Something is going to happen,” declares a young dentist home for the Christmas holidays from the USA, as he observed the touristic monstrosities that have closed the windows to the calm Caribbean Sea on the island’s west coast and pushed locals into the hinterland. “You can’t have gated developments like Apes Hill, while most of the people are being bundled into little areas with bad roads at ridiculous prices. And if house prices have gone through the roof as the island caters to tourist tastes for gated communities on golf courses, food prices have gone over the moon. “A little chicken, like a little pigeon, is all $15 dollars,” comments an office administrative assistant who is itching to start a consumer advocacy campaign to boycott poultry sales at supermarkets. “We should stand outside supermarkets and encourage people going in not to buy the chicken,” she says. Even a Barbadian malt pop which sells for 79 cents in an Ontario, Canada supermarket costs Bds$1.69 in a popular supermarket chain on the island. “I am no politician but (Prime Minister) David Thompson ain’t doing a thing except shuffle ’round the taxes; he say he give you this but increase something else over there so you don’t gain (anything)!” adds the agitated woman. A teacher argues that the difference between Thompson’s Democratic Labour Party (DLP), which regained power at the start of 2008, and the previous Owen Arthur Barbados Labour Party (BLP) administration that had governed for 14 years, is that the Dees lay emphasis on social programs while the Bees “did a lot of infrastructure work,” so more people-oriented projects may be on the cards. The state of the highways and roads in communities do not verify the BLP’s infrastructure credentials although a seaside boardwalk from near Bridgetown into neighbouring Christ Church has beautified the south coast, the lower end of the two major touristic haunts on the island. The government also invested $300 million into rebuilding an elegant Kensington Oval, the West Indies cricket Mecca, in preparation for the financially disastrous International Cricket Council 2007 World Cup series. New commercial buildings in the city and its growing satellite of Warrens are mainly works of the established business sector. Low income housing development has occurred but nowhere near adequate to address the needs on a crowded 166 square mile island of more that 260,0000 people. So old race arguments persist. 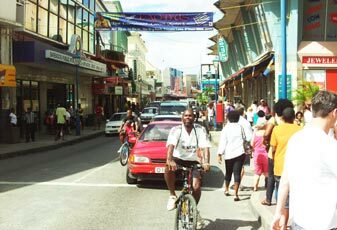 The five per cent or so white Bajans continue to own more than half of the wealth. The thing is that the whites, like C.O. Williams, a self-made man, who developed a multimillion dollar marina on the golden tourist west coast some years ago and is author of the Apes Hill community, build housing estates aimed at wealthy tourists. Poor black families, who had been forced onto the beaches in the pre tourism boom times as whites concentrated on the fertile sugar plantation lands, are being offered small fortunes to relocate; but the cool low hill regions with an island view are also being targeted for tourists. Some of the new rich from the land sales, professions and entrepreneurship invest in mini hillside palaces that do not earn an income. Others buy or build in the south-eastern parish of St Philip, that takes the full brunt of the prevailing Atlantic winds and corrosive salt spray, packed along narrow bumpy roads. For the poor, who continue to live on old plantation yards in movable chattel houses or on government housing estates such as Deacon’s Farm and Grazettes in St Michael where Bridgetown is located and Silver Hill and Gall Hill in Christ Church, life continues as a communal grind with a visibly growing presence of the defiant Rastafari lifestyle and idle youth indulging in board games, gangs and illicit drugs. The pull of the tourism building boom with its pressure on domestic real estate and the push of decades of political mismanagement in Guyana, has seen an influx of labourers from the Caribbean Community (CARICOM) South American neighbour who are now facing a backlash of resentment as Barbadian nationals get caught in the wedge created by the global financial crisis (tourism is expected to contract by two per cent in 2008), the roller coaster oil prices and the withering of European Community sugar markets. 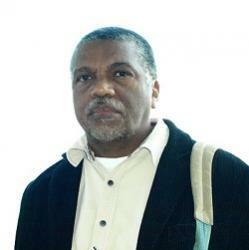 There is a suggestion that the resentment is to the mainly Indo Guyanese migrant community as even long-time resident and leading Caribbean journalist, Rickey Singh, has been facing verbal attack for commenting on domestic Barbadian issues. Historically, Barbados has been a leader in matters of regional integration, notwithstanding dribs and drabs of the parallel insularity. 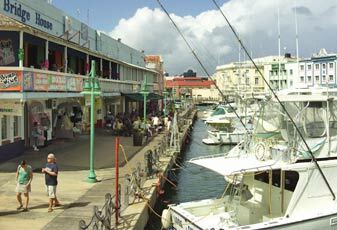 While like the rest of the Caribbean, it has experienced its periods of economic and social tumult, the most recent in the early 1990s, when unions took to the streets as then prime minister Erskine Sandiford grappled with warding off the International Monetary Fund and devaluation, it maintains a state of orderliness which brings it through these times especially based on its educated population that in general ultimately behaves in a reasoned manner. So, all these years later the dollar still retains its 50 per cent parity against its US counterpart. Governments have generally remained firm while taking council from civil society partners, labour and the business community. There is the memorable instance of the Mighty Gabby raising his voice “da beach is mine, I can bathe anytime” in his calypso “Jack” as the government backed down on bringing private tourist beaches to the island. The dentist quoted earlier believes that sociology is being eroded as the government and big business embrace the theory of tourism economic trickle down, which he believes is not a credible model but being embraced all of the Caribbean, as even beach sand is being stolen in places like Jamaica to enhance resort properties. We met a graduate student from the local Cave Hill campus of the University of the West Indies conducting interviews for a study on public perception on whether tourism’s positive impacts outweigh the negatives. The results should be interesting. In the meantime we can make a safe bet that Barbados’ socio-economic ragga-soca, insularity and all, is pretty much the tune being danced to by its CARICOM tourism-dependent partners. Tourists enjoy the ambiance and cuisine at the shallow draught Careenage, Bridgetown, Barbados. Shoppers still crowd Broad Street after the Christmas rush. Large residences spring from the low hillsides of the interior of the island. 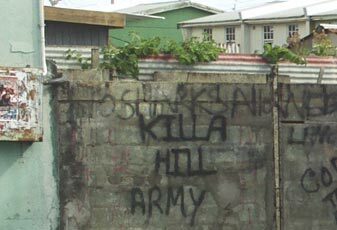 Killa Hill Army, sign of the idle times in the Silver Hill/Gall Hill area.